Questions & Answers 2 is now available for free download. Questions & Answers 2 is a collection of questions and answers published in prior editions of the Supreme Master Ching Hai News Magazine that have been arranged in topics and listed alphabetically. Get answers to your questions quickly and easily by clicking on the topic. The ebook will then take you to the section that contains Master's response to that question. The ebook is complete; just download and run. 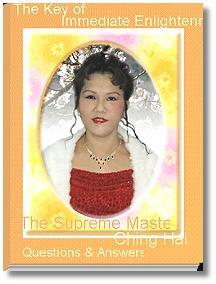 Sit back and enjoy Master Ching Hai's responses to hundred of questions. As an extra bonus: Listen to Master Ching Hai's interview with Cape Town talk show host and be the first to see two new photos of Master. Nothing extra is needed to read the newest addition to Master's diverse array of media, the ebook. Download takes approximately one hour with 56Kps connection. File size is about 14Mb.